Progress Reports and Memories | "Northern Crossings"
“My days of old have vanished in tone and tint”. Those last words of General McArthur have haunted me for years. Memories, at least for me, have a sepia tint like old photographs found in a drawer somewhere and half remembered. My memories of Africa however are more vibrant and the colors still identifiable and always the sunsets and rises dominate. The children in their uniforms are good examples of memory. The blue sweaters and white shirts that I marveled at for their brightness give witness to a sense of pride and care for appearance but also of thankfulness for what one has been given. For people who wear some clothes a couple of times and jam them into a closet somewhere until they are tossed into a bag and thrown away so the closet can be filled with more stuff have no understanding of that memory, or that vision. The picture here is a representation of what my memory is. This is a picture of a picture. It is Udom Boarding School and the preparation of the evening meal. 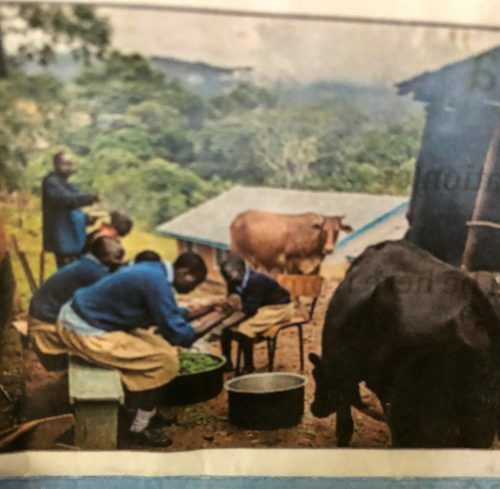 The curiosity of the cattle and their condition speaks well of the stewardship of the place and the concern for the children and their milk supply. Local ownership and pride in this “mercy work” is coming into its own. The gentleman responsible for much of this is John Kissinger N’yangau and he will be presenting the wok being done in Kenya with Project 24 at Crosspoint Lutheran Church in Fargo September 30 at 4pm. Crosspointe is at 4550 37th Av S in Fargo. If you can attend pleasr let Pastor Mike Giddings know today by calling 701-306-9584. Reports from Kissinger are a change to recharge and recolor my memories. I pray you take the opportunity to go and see him and get a glimpse of what I remember and it might change your life. The One who Gave It All………..